As the long winter is nearing its chilly end and the warm spring around the corner, many anglers are preparing their fishing gear for the new year. 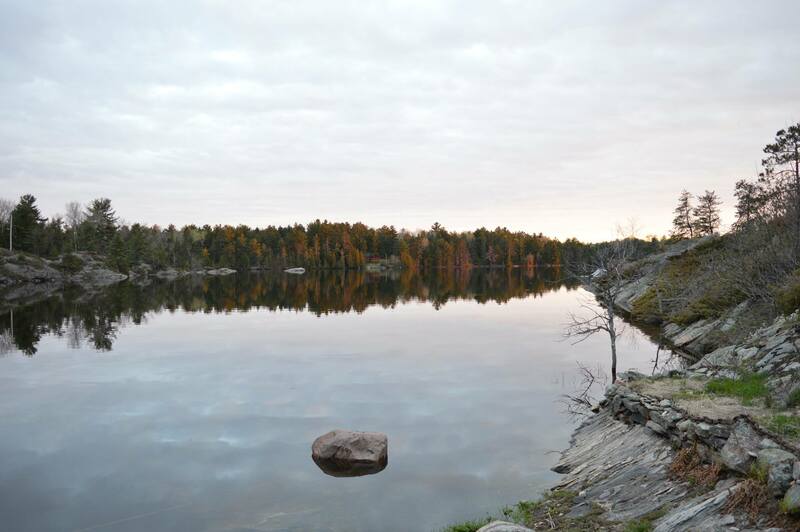 On the third Saturday, May 19th, Walleye and Northern Pike will kickstart the Spring Opener for the 2018 season on the French River. Spring can be the most rewarding time of year to fish for either walleye or pike, but it can also be the most challenging. Finding either species, usually is the hardest part of catching them after the spring thaw. However, if you tailor your search methods to the water color and temperature then you’ll be on the biggest game fish of the season in no time. Walleye fishing is about being at the right place at the right time. In spring, some of the largest factors depend on the weather and water conditions as they can affect when walleye and other species of French River fish feed and spawn. Now while all freshwater fish are “cold-blooded”, some species are more sensitive to temperature change than others. Pike and Walleye are considered “cool or cold” water fish and are some of the first species of fish to spawn in the French River system. Pike normally spawn at 40 – 52 degrees Fahrenheit (4 – 11 Celsius). 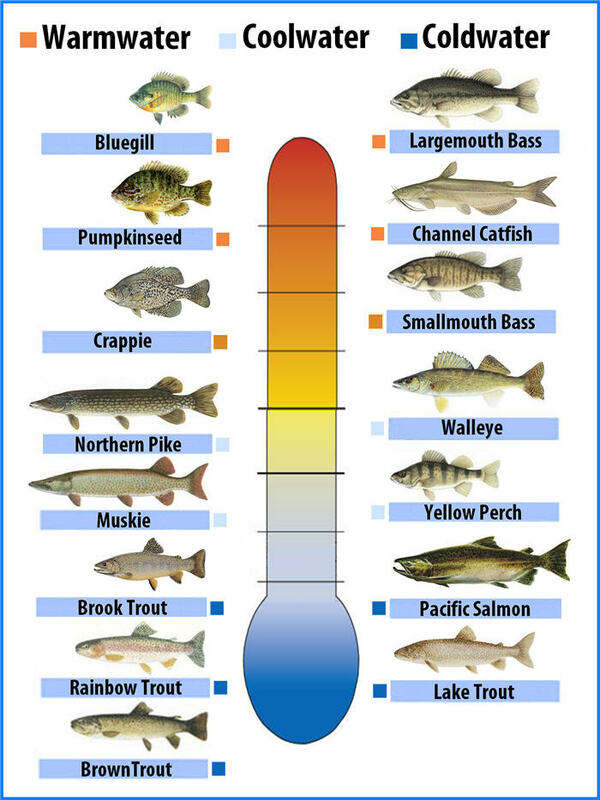 Chart detailing preferred water temps of many common freshwater species of fish. Mother Nature controls the weather conditions on the French River and we can all hope for an early spring, so the normal cycle of fishing patterns can be seen again. This means when the season starts, both pike and walleye have already spawned while other species of fish such as largemouth and smallmouth bass are on their beds. 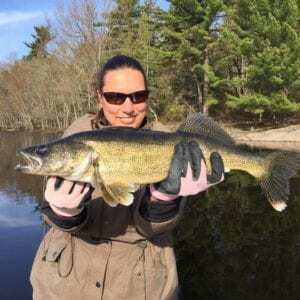 Even post spawn for walleyes, this makes the mouths of rivers, bottlenecked channels (with current), and bays prime spots to fish on the French River early in the Spring Opener. Shallower and warmer waters in back bays gives opportunity for new weed growth to provide small pan and bait fish cover from the feeding pike and walleyes. Older walleye (particularly females) however, switch from what is abundant to what they fancy most—soft-rayed forage fish such as herring, whitefish and smelt that don’t have sharp dorsal fins and spines. The larger and experienced females can reduce their metabolism in the colder water which allows them to devote more time and energy towards growth and egg production for future spawn. So in the spring, if you want to catch numbers of aggressive walleye, fish close to the shallow spawning areas using slower swimming crankbaits and spinners. But if you’ve set your sights on catching the trophy of a lifetime, go deeper near those feed areas, searching for underwater structures and cover using jigs and live baits such as minnow or nightcrawlers. than 1 greater than 60 cm (23.6 in.) in your possession. (34 in.) in your possession. To obtain your fishing license and regulations. Information Researched and Authored by Joe Barefoot, M.B. For more in depth analysis along with other techniques, visit these experts in the following links.